The NBA has stepped up to bringing good change by commencing payments of fees online. The new system is expected to make the transactions easier and more convenient for lawyers while also encouraging transparency in the affairs of the NBA. The idea is one of the promises made by the NBA leadership during the campaign. NBA including Bar Practice Fees. • Ease of payments to NBA by and from lawyers and other stakeholders. 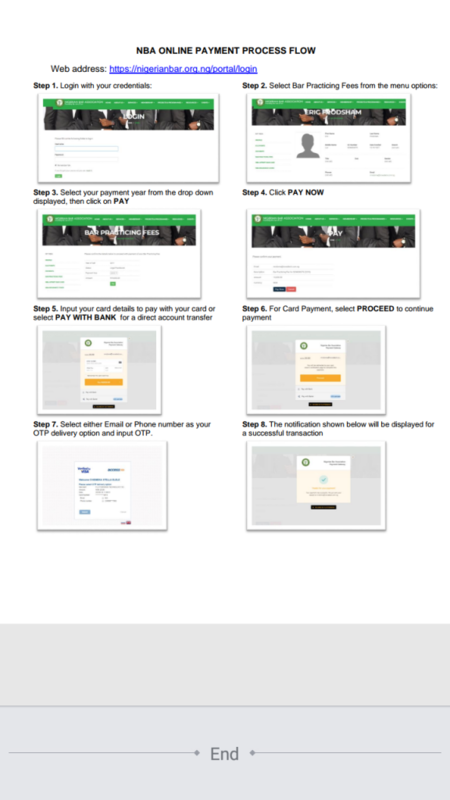 Payments can be made online, both within and outside Nigeria. Kindly click on (https://nigerianbar.org.ng/portal/) to login to the new NBA portal. activation code link to set up your password. Court (SC) number and follow the instructions to reset your password. and for mobile users, it is located on the left side. to begin the verification process. A process flow diagram is attached to this message for your assistance. The image below is what the process flow is expected to look like.